Mr. Mano Ganesan (Left) meets Mr. Thamilchelvan. Mr. Ganesan said that he conveyed some messages from the Southern political leaders to Mr. Thamilchelvan, and got the LTTE’s response to those messages. 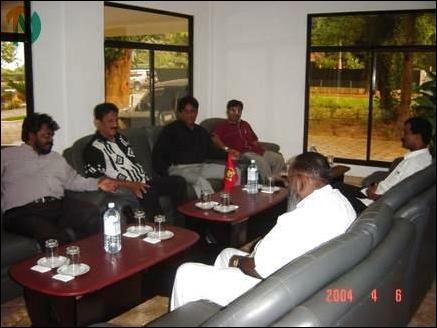 He said that the meeting was part of an exercise in good relations that his party has with LTTE. The WPPF leader said that the LTTE has expressed its support with clarity and decisiveness for his party in actively engaging in the political process representing the Tamil people in the Western province, anchored in the Colombo district. Through political talks, the WPPF in turn will assist the national liberation struggle of the Tamil people, said Mr. Ganesan. Mr. Mano Ganesan (Third from Left) and his team talking to Mr. Thamilchelvan (extreme right) Tuesday.